본 발명은 무선통신 서비스를 제공하는 무선통신 시스템과 단말에 관한 것으로서, UMTS (Universal Mobile Telecommunications System) 에서 진화된 E-UMTS (Evolved Universal Mobile Telecommunications System) 또는 LTE 시스템 (Long Term Evolution System)에서 기지국과 단말이 데이터 블록을 주고 받는 방법에 관한 것으로, 송신측이 공통제어논리채널(Common Control Logical Channel)을 통해 전송되는 데이터를 수신측에 효율적으로 전송하고, 상기 수신측은 상기 공통제어논리채널을 통하여 수신된 데이터를 정확하게 분리해 내어, 필요 없는 데이터를 구분해 내도록 하는 방법에 관한 것이다. The present invention relates to a wireless communication system and a terminal providing a wireless communication service, in the UMTS (Universal Mobile Telecommunications System) The E-UMTS (Evolved Universal Mobile Telecommunications System) or a LTE system (Long Term Evolution System) evolved from the base station and the receiving end terminal is directed to a method to send and receive data block, the transmitting the common control logical channel (common control logical channel) received efficiently transmitted, and the data on the receiving side to be transmitted through the through the common control logical channel out accurately separate the data relates to a method for distinguishing naedorok unneeded data. 본 발명은 무선통신 서비스를 제공하는 무선통신 시스템과 단말에 관한 것으로서, UMTS (Universal Mobile Telecommunications System) 에서 진화된 E-UMTS (Evolved Universal Mobile Telecommunications System) 또는 LTE 시스템 (Long Term Evolution System)에서 기지국과 단말이 데이터 블록을 주고 받는 방법에 관한 것으로, 송신측은 공통제어논리채널(Common Control Logical Channel)을 통해 전송되는 데이터를 수신측에 효율적으로 전송하고, 상기 수신측은 상기 공통제어논리채널을 통하여 수신된 데이터를 정확하게 분리해 내어, 필요 없는 데이터를 구분해 내도록 하는 방법에 관한 것이다. The present invention relates to a wireless communication system and a terminal providing a wireless communication service, in the UMTS (Universal Mobile Telecommunications System) The E-UMTS (Evolved Universal Mobile Telecommunications System) or a LTE system (Long Term Evolution System) evolved from the base station and the terminal is directed to a method to send and receive data block, the transmitter and efficiently transmitted to the data transmitted on a common control logical channel (common control logical channel) to the receiving side, the receiving side the received via the common control logical channel out accurately separate the data, the present invention relates to a method for distinguishing naedorok unneeded data. 도 1은 종래 및 본 발명이 적용되는 이동통신 시스템인 E-UMTS(Evolved Universal Mobile Telecommunications System)의 망구조를 나타낸 그림이다. 1 is a figure showing a network structure of a conventional and the E-UMTS (Evolved Universal Mobile Telecommunications System) mobile communication system to which the present invention is applied. E-UMTS시스템은 기존 UMTS시스템에서 진화한 시스템으로 현재 3GPP에서 기초적인 표준화 작업을 진행하고 있다. E-UMTS system is a system evolving from the existing UMTS system advances the basic standardization work in the current 3GPP. E-UMTS 시스템은 LTE(Long Term Evolution) 시스템이라고 할 수도 있다. E-UMTS system may be called (Long Term Evolution) LTE system. E-UMTS망은 크게 E-UTRAN과 CN으로 구분 할 수 있다. E-UMTS network can be classified into E-UTRAN and CN. E-UTRAN은 단말 (User Equipment; 이하 UE로 약칭)과 기지국 (이하 eNode B로 약칭), 망의 종단에 위치하여 외부망과 연결되는 서빙 게이트웨이(Serving Gateway; 이하 S-GW로 약칭) 그리고 단말의 이동성을 관장하는 이동관리개체(Mobility Management Entity; 이하 MME로 약칭)으로 구성되어 있다. The E-UTRAN UE (User Equipment; hereinafter abbreviated UE) and a base station (hereinafter referred to as eNode B in abbreviation), located at the end of the network, the serving gateway to the external network (Serving Gateway; hereinafter abbreviated S-GW) and terminal mobility management object in charge of the mobility; consists of a (mobility management Entity MME hereinafter abbreviated). 하나의 eNode B에는 하나 이상의 셀(Cell)이 존재할 수 있다. One eNode B may exist in more than one cell (Cell). 도 2는 3GPP 무선접속망 규격을 기반으로 한 단말과 E-UTRAN 사이의 무선인터페이스 프로토콜 (Radio Interface Protocol)의 구조를 나타낸다. 2 shows a structure of a radio interface protocol (Radio Interface Protocol) between a terminal and E-UTRAN based on 3GPP radio access network standard. 상기 무선인터페이스 프로토콜은 수평적으로 물리계층(Physical Layer), 데이터링크계층(Data Link Layer) 및 네트워크계층(Network Layer)으로 이루어지며, 수직적으로는 데이터정보 전송을 위한 사용자평면(User Plane)과 제어신호(Signaling)전달을 위한 제어평면(Control Plane)으로 구분된다. The radio interface protocol has horizontal to the physical layer (Physical Layer), made of a data link layer (Data Link Layer) and a network layer (Network Layer), vertical to a user plane (User Plane) and control for data information transfer It is divided into a control signal plane (control plane) for (signaling) transmission. 프로토콜 계층들은 통신시스템에서 널리 알려진 개방형시스템간상호접속 (Open System Interconnection; OSI)기준모델의 하위 3개 계층을 바탕으로 L1 (제1계층), L2 (제2계층), L3(제3계층)로 구분될 수 있다. Protocol layers are well-known Open Systems Interconnection in a communication system (Open System Interconnection; OSI) based on three lower layers of the reference model L1 (first layer), L2 (second layer), L3 (third layer) as it can be distinguished. 이하에서 상기 도 2의 무선프로토콜 제어평면과 도3의 무선프로토콜 사용자평면의 각 계층을 설명한다. Hereinafter will be described with each layer of the radio protocol user plane of FIG. 3 to FIG radio protocol control plane of FIG. 제1계층인 물리계층은 물리채널(Physical Channel)을 이용하여 상위 계층에게 정보전송서비스(Information Transfer Service)를 제공한다. A first layer, the physical layer provides the physical channels (Physical Channel) information transfer service (Information Transfer Service) to an upper layer by using a. 물리계층은 상위에 있는 매체접속제어(Medium Access Control)계층과는 전송채널(Transport Channel)을 통해 연결되어 있으며, 이 전송채널을 통해 매체접속제어계층과 물리계층 사이 의 데이터가 이동한다. The physical layer and MAC (Medium Access Control) layer in the top is connected via a transmission channel (Transport Channel), and the data movement between the transport channel to a medium access control layer and the physical layer via. 그리고, 서로 다른 물리계층 사이, 즉 송신측과 수신측의 물리계층 사이는 물리채널을 통해 데이터가 이동한다. Then, each data is moved between different physical layers, i.e., the transmitting side and the receiving side of the physical layer through a physical channel. 제2계층의 매체접속제어 (Medium Access Control; 이하 MAC로 약칭)는 논리채널(Logical Channel)을 통해 상위계층인 무선링크제어(Radio Link Control)계층에게 서비스를 제공한다. The second medium access control layer (Medium Access Control; hereinafter abbreviated MAC) provides a service to the logical channels (Logical Channel) in a radio link control upper layers through (Radio Link Control) layer. 제2계층의 무선링크제어(Radio Link Control; 이하 RLC로 약칭)계층은 신뢰성 있는 데이터의 전송을 지원한다. Second radio link control layer (Radio Link Control; hereinafter abbreviated RLC) layer supports the transmission of reliable data. RLC 계층의 기능이 MAC내부의 기능 블록으로 구현될 수도 있다. The function of the RLC layer may be implemented as a functional block inside the MAC. 이러한 경우에는 RLC계층은 존재하지 않을 수도 있다. In these cases, the RLC layer may not exist. 제2계층의 PDCP 계층은 IPv4나 IPv6와 같은 IP 패킷 전송시에 대역폭이 작은 무선 구간에서 효율적으로 전송하기 위하여 상대적으로 크기가 크고 불필요한 제어정보를 담고 있는 IP 패킷 헤더 사이즈를 줄여주는 헤더압축 (Header Compression) 기능을 수행한다. A second compressed header for reducing an IP packet header size containing a relatively large and unnecessary control the size information to the PDCP layer in order to efficiently transfer from the IP packet radio section smaller bandwidth for transmission, such as IPv4 or IPv6 in the hierarchy (Header It performs Compression) function. 제3계층의 가장 하부에 위치한 무선자원제어(Radio Resource Control; 이하 RRC라 약칭함)계층은 제어평면에서만 정의되며, 무선베어러 (Radio Bearer; RB라 약칭함)들의 설정(Configuration), 재설정(Re-configuration) 및 해제(Release)와 관련되어 논리채널, 전송채널 및 물리채널들의 제어를 담당한다. The RRC is located in the lower portion of the third layer (Radio Resource Control; hereinafter RRC la abbreviated as) layer is defined only in the control plane, the radio bearer (Radio Bearer; RB la abbreviated as) of the set (Configuration), reset (Re It is associated with a -configuration) and a release (release) is responsible for control of logical channels, transport channels and physical channels. 이때, RB는 단말과 UTRAN간의 데이터 전달을 위해 제2계층에 의해 제공되는 서비스를 의미한다. In this case, RB means a service provided by the second layer for data transmission between the terminal and the UTRAN. 이때, RB는 단말과 UTRAN간의 데이터 전달을 위해 무선 프로토콜의 제1 및 제 2계층에 의해 제공되는 논리적 경로(path)를 의미하고, 일반적으로 RB가 설정된다는 것은 특정 서비스를 제공하기 위해 필요한 무선 프로토콜 계층 및 채널의 특성을 규정하고, 각각의 구체적인 파라미터 및 동작 방법을 설정하는 과정을 의미한다. In this case, RB is Being means a logical path (path) provided by the first and second layers of the radio protocol for data transmission between the terminal and the UTRAN and, in general, RB is set radio protocol required for providing a specific service stipulating the characteristics of a layer and a channel, and refers to the process of setting the respective detailed parameters and operation methods. 특 정 단말의 RRC계층과 UTRAN의 RRC계층이 서로 RRC 메시지를 주고 받을 수 있도록 연결되어 있을 때 해당 단말은 RRC연결 상태(Connected state)에 있게 되며, 연결되어 있지 않을 때 해당 단말은 휴지상태(Idle state) 상태에 있게 된다. The terminal time when a specific RRC layer and the UTRAN in the RRC layer of the terminal are connected to each other can exchange RRC messages, the UE does not, the connection is to be in RRC connected state (Connected state) is the idle state (Idle It is in the state) state. 논리채널(Logical channel)은 RLC엔티티와 MAC엔티티 사이에서 정의되는 채널이며, 상기 논리채널상의 데이터의 특성에 따라서 구분될 수 있다. Logical channels (Logical channel) can be divided according to the RLC entity and a MAC channel which is defined between the entities, attributes of the data on the logical channel. 전송채널(Transport Channel)은 물리계층과 MAC엔티티 사이에서 정의되는 채널이며, 상기 전송채널상의 데이터가 어떤 방식으로 전송되는지에 따라서 구분될 수 있다. Transport channels (Transport Channel) is a channel that is defined between the physical layer and the MAC entity, and the data on the transport channel can be classified according to whether the transmission in any way. 일반적으로, CCCH(Common Control Channel)는 공통제어채널로서, 단말이 기지국과 RRC연결을 맺지 않은 상태에서 상기 기지국으로 메시지를 보내거나, 혹은 단말이 어떤 기지국과 RRC연결을 맺었으나, 상기 단말이 현재 접속하고 있는 기지국이, 상기 단말과 RRC연결을 맺고 있는 기지국과 다를 경우에 상기 단말이 RRC메시지를 전송할 경우 사용된다. In general, (Common Control Channel) CCCH is a common control channel, but the terminal to send a message to the base station in the state that bears the base station and the RRC connection, or or the terminal is entered into a RRC connection with any base station, wherein the terminal current that is connected to the base station, if different from the subscriber station and the base station with whom the RRC connection is the user terminal is used when sending an RRC message. 이와 더불어, 기지국도 자신과 RRC연결을 맺지 않은 단말에게 RRC메시지를 전송할 때 CCCH를 사용한다. In addition, the base station also uses the CCCH when transmitting the RRC messages to the mobile station itself and that bear the RRC connection. 이와는 반대로, RRC연결을 맺은 상태에서 단말과 기지국이 RRC메시지 같은 제어메시지 혹은 사용자 데이터를 주고 받을 때에는, DCCH(Dedicated Control Channel; 전용제어채널) 또는 DTCH(Dedicated Traffic Channel; 전용 트래픽 채널)를 사용하게 된다. To use; (Dedicated Traffic Channel Dedicated Traffic Channel); In contrast, in the state signed an RRC connection when sending and receiving a control message or user data, such as the subscriber station and the base station is the RRC message, DCCH (Dedicated Control Channel Dedicated Control Channel) or a DTCH do. 이 경우, CCCH를 통해서 전송되는 메시지와 DTCH/DCCH를 통해서 전송되는 메시지 또는 데이터를 효과적으로 구분할 필요가 있다. In this case, it is necessary to effectively separate the message or data transmitted through a message and a DTCH / DCCH is transmitted over the CCCH. 이를 위해서 종래의 제안에 따르면, 기지국과 단말은 복수개의 C-RNTI(Cell Radio Network Temporary Identity)를 사용하여 상기 채널들을 구분한다. According to a conventional proposed to this end, the BS and the MS separates the channels using two C-RNTI (Cell Radio Network Temporary Identity) plurality. 예를 들어, PDCCH(Physical Downlink Control Channel)를 통해서 PDSCH(Physical Downlink Shared Channel) 또는 PUSCH(Physical Uplink Shared Channel)의 전송을 알릴 때, 상기 PDSCH 또는 PUSCH를 통해서 CCCH의 데이터가 전송되면 C-RNTI A를 사용하고, DTCH 또는 DCCH의 데이터가 전송되면 C-RNTI B를 사용하는 것이다. For example, if via the PDCCH (Physical Downlink Control Channel) notify the transmission of the PDSCH (Physical Downlink Shared Channel) or PUSCH (Physical Uplink Shared Channel), data of the CCCH is transmitted through the PDSCH or the PUSCH when the C-RNTI A When the user, and transmits data of the DTCH or DCCH is to use the C-RNTI B. 그런데 이 방법은, 수신측이 항상 복수개의 C-RNTI를 모니터링 해야 한다는 점에서, 전력소모의 낭비 및 복잡도의 증가를 일으킨다. However, this method, the receiving side is always in that to monitor a plurality of C-RNTI, to cause an increase in the complexity and waste of power consumption. 또한 RRC연결을 맺지 못한 단말의 경우, C-RNTI가 할당이 되지 않는다. In addition, if the terminal did not bear the RRC connection, but the C-RNTI is not allocated. 이 경우, C-RNTI를 통해서 어떤 논리채널의 데이터인지 구분하기는 쉽지 않으므로 상기의 방법을 사용하기가 쉽지 않다. In this case, through the C-RNTI it is not easy to distinguish whether the data of which logical channel is not easy to use the above method. 또한 RRC연결을 맺기 전의 단말의 경우, 상기 단말은 기지국과 설정한 RB(radio bearer)가 없다. In the case of the terminal prior to entering into a RRC connection, the UE has no RB (radio bearer) is set and the base station. 반면 RRC연결을 맺은 단말은 기지국과 설정된 몇 개의 RB를 가지고 있다. Whereas terminal signed an RRC connection has a number of RB is set with a base station. 이는 전송채널과 논리채널의 매핑을 담당하는 MAC 엔티티의 입장에서, RACH과정 수행 중에 송수신되는 각각의 메시지의 내용을 구분 해야 함을 의미한다. This means that from the perspective of the MAC entity responsible for the mapping of transport channels and logical channels, should be separated from the contents of each message sent and received while performing RACH process. 즉, MAC PDU(Protocol Data Unit)의 입장에서 각각의 상황을 구분해야 하는 방법이 필요한 것이다. In other words, from the perspective of the MAC PDU (Protocol Data Unit) you will need a way to be separated from each situation. 따라서 본 발명은 기지국과 단말이 데이터 및 제어 메시지를 주고 받는 과정에서, 효과적으로 각각의 데이터 및 제어 메시지의 타입을 구분하는 방법을 제시하고자 한다. Thus, the present invention is in the process of the base station and the terminal to send and receive data and control messages, and to present a method for effectively separating the types of the respective data and control messages. 보다 자세하게, 본 발명에서는 MAC엔티티가 수신된 MAC PDU를 MAC SDU로 재구성하여 상위단으로 전달하거나, 혹은 상위단으로부터 수신한 MAC SDU를 MAC PDU로 구성하여 전송하는 과정에 있어서, 공통제어채널(CCCH)의 데이터와 그렇지 않은 데이터를 쉽게 구분하고 효과적으로 전송할 수 있는 방법을 제시하고자 한다. More specifically, in the process of the present invention, by reconfiguring a MAC PDU with a MAC entity receiving a MAC SDU delivered to the upper end, or transmission by configuring a MAC SDU received from the upper stage to the MAC PDU, the common control channel (CCCH ) easily distinguish the data and non-data, we propose a method that can be transmitted efficiently. 상기와 같은 본 발명의 과제 해결을 위하여,무선 통신 시스템상에서 프로토콜 데이터 유닛(protocol data unit; PDU)을 구성 하는 방법으로서, 상위 단으로부터 공통 논리 채널(common logical channel)을 통해서 적어도 하나의 서비스 데이 터 유닛(service data unit; SDU)을 수신하는 단계와; To the problem solution of the present invention as described above, the protocol data units over a wireless communication system; a method for configuring (protocol data unit PDU), at least one service through the common logical channel (common logical channel) from the upper-stage data unit; the method comprising: receiving a (service data unit SDU) and; 상기 프로토콜 데이터 유닛 구성을 위해서 상기 적어도 하나의 수신된 서비스 데이터 유닛에 헤더를 추가하는 단계에 있어서, 상기 헤더는 적어도 하나의 필드를 포함하고 상기 적어도 하나의 필드는 논리채널을 구별하기 위하여 사용되거나 또는 제어정보의 종류를 구별하기 위하여 사용되며, 상기 적어도 하나의 필드를 상기 구성된 프로토콜 데이터 유닛안에 포함된 상기 적어도 하나의 서비스 데이터 유닛이 상기 공통 논리 채널로부터 수신되었음을 나타내기 위해 설정하는 단계와; In the method comprising: for the protocol data unit configuration adds a header to the at least one received service data unit, the header comprises at least one field and the at least one field is used to distinguish a logical channel or is used to distinguish the type of control information, the method comprising the at least one of the at least one service data unit included in the constructed PDUs to the field set to indicate that the reception from the common logical channels; 그리고 상기 구성된 프로토콜 데이터 유닛을 하위 단으로 전달하는 단계를 포함하는 것을 특징으로 한다. And it characterized by including the step of delivering the constructed PDUs to the lower stage. 바람직하게는, 상기 공통 논리 채널은 공통 제어 채널(CCCH)인 것을 특징으로 한다. Preferably, the common logical channel is characterized in that the common control channel (CCCH). 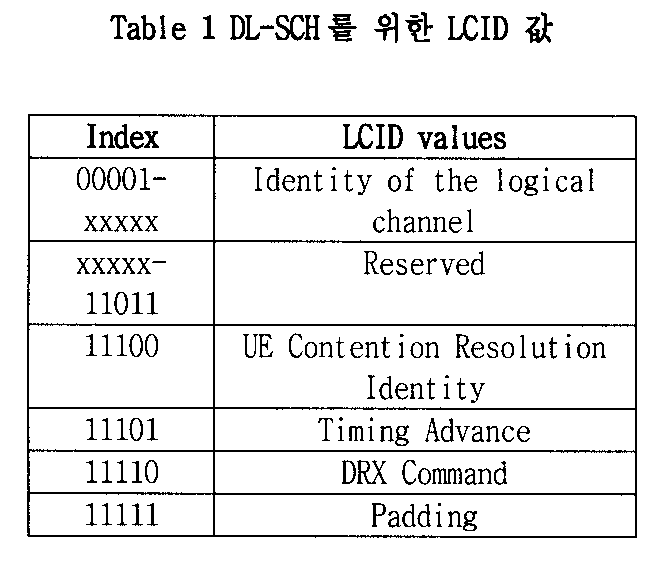 바람직하게는, 상기 적어도 하나의 필드는 논리 채널 ID (LCID; Logical Channel ID) 채널인 것을 특징으로 한다. Advantageously, it said at least one field is the logical channel ID; characterized in that (LCID Logical Channel ID) channel. 바람직하게는, 상기 적어도 하나의 필드는 특정 값으로 설정되는 것을 특징으로 한다. Advantageously, it said at least one field being set to a specific value. 바람직하게는, 상기 특정 값이 00000로 설정되는 것을 특징으로 한다. Preferably, further it characterized in that the specific value is set to 00000. 바람직하게는, 상기 특정 값은 공통 제어 채널을 지시하기 위해 설정되는 것을 특징으로 한다. Preferably, the specific value is characterized in that which is set to indicate the common control channel. 바람직하게는, 상기 적어도 하나의 필드의 크기는 5 비트인 것을 특징으로 한다. Preferably, the size of the at least one field may be a 5 bit. 바람직하게는, 상기 PDU는 MAC(Medium Access Control) PDU이고 상기 적어도 하나의 SDU는 MAC SDU인 것을 특징으로 한다. Preferably, the PDU is a MAC (Medium Access Control) PDU and the at least one SDU may be a MAC SDU. 바람직하게는, 상기 적어도 하나의 필드는 MAC PDU안에 포함된 각각의 MAC SDU, MAC control element 또는 패딩을 위해 사용되는 것을 특징으로 한다. Advantageously, said at least one field being used for each MAC SDU, MAC control element or padding included in the MAC PDU. 본 발명에서는 MAC엔티티가 MAC PDU를 구성함에 있어서, 공통제어논리채널 정보를 효과적으로 전송하는 방법을 제시하여, 불필요한 전력낭비 없이 데이터 전송의 효율을 높이는 효과를 가져온다. In the present invention, as the MAC entity to configure the MAC PDU, to present a method for transmitting a common control logical channel information effectively, resulting in an effect of enhancing the efficiency of data transmission, without unnecessary power consumption. 본 발명의 기본 개념은 기지국과 단말이 데이터 블록 또는 데이터 유닛을 주고 받는 무선 통신 시스템상에서 프로토콜 데이터 유닛(protocol data unit; PDU)을 구성 하는 방법으로서, 상위 단으로부터 공통 논리 채널(common logical channel)을 통해서 적어도 하나의 서비스 데이터 유닛(service data unit; SDU)을 수신하는 단계와; The basic idea of ​​the invention the protocol data unit on a radio communication system to which the base station and the terminal to send and receive data blocks or data units; A method for configuring (protocol data unit PDU), the common logical channel (common logical channel) from the upper end of at least one service data unit through; the method comprising: receiving a (service data unit SDU) and; 상기 프로토콜 데이터 유닛 구성을 위해서 상기 적어도 하나의 수신된 서비스 데이터 유닛에 헤더를 추가하는 단계에 있어서, 상기 헤더는 적어도 하나의 필드를 포함하고 상기 적어도 하나의 필드는 논리채널을 구별하기 위하여 사용되거나 또는 제어정보의 종류를 구별하기 위하여 사용되며, 상기 적어도 하나 의 필드를 상기 구성된 프로토콜 데이터 유닛안에 포함된 상기 적어도 하나의 서비스 데이터 유닛이 상기 공통 논리 채널로부터 수신되었음을 나타내기 위해 설정하는 단계와; In the method comprising: for the protocol data unit configuration adds a header to the at least one received service data unit, the header comprises at least one field and the at least one field is used to distinguish a logical channel or is used to distinguish the type of control information, the method comprising the at least one of the at least one service data unit included in the constructed PDUs to the field set to indicate that the reception from the common logical channels; 그리고 상기 구성된 프로토콜 데이터 유닛을 하위 단으로 전달하는 단계를 포함하는 것을 특징으로 하는 무선 통신 시스템상에서 프로토콜 데이터 유닛을 구성하는 방법을 제안하고 이러한 방법을 수행할 수 있는 무선 이동통신 단말기를 제안한다. And it proposes a wireless mobile communication device that can offer a method of configuring a protocol data unit on a radio communication system characterized in that it comprises the step of transferring the constructed PDUs to the lower end and to perform such a method. 상기 도 4는 MAC엔티티에서 사용하는 MAC PDU의 포맷을 보여주고 있다. FIG 4 illustrates a format of a MAC PDU using the MAC entity. 상기 도 4에서 LCID는 해당되는 MAC SDU가 어떤 논리채널에 해당되는지 알려주고, L 필드는 해당 MAC SDU의 크기를 알려준다. In FIG. 4 is LCID corresponding MAC SDU is informed that corresponds to which logical channel, L field indicates the size of the MAC SDU. 그리고 E 필드는 추가적으로 헤더들이 존재하는지의 여부를 알려준다. And E field indicates whether there are additional headers. 상기 과정에서, 만약 해당되는 MAC SDU또는 MAC Control Element의 크기가 127보다 같거나 작으면 도 5에서 예시되어있는 7 bit의 L필드가 사용되고, 만약 해당되는 MAC SDU또는 MAC Control Element의 크기가 127보다 크다면 15bit의 L필드가 사용된다. In the process, if more than the size of the MAC SDU or MAC Control Element which is equal to 127, or small, also the L field of the 7 bit, which is illustrated at 5 in use, and if the size of the MAC SDU or MAC Control Element is the 127 the L field is used for 15bit is greater. 그리고 MAC PDU에 포함된 MAC SDU에 대한 MAC 서브헤더(Sub-header) 또는 크기가 고정된 MAC Control Element에 대해서는 도 5(b)에 나온 형식의 MAC 서브헤더(Sub-header)가 사용되고, 그 외의 경우에는 도 5(a)에 나온 형식의 MAC 서브헤더(Sub-header)가 사용된다. And the MAC to the MAC SDU included in the MAC PDU sub-header (Sub-header) or a fixed size the MAC Control Element in Figure 5 (b) The format of the MAC sub-header (Sub-header) out to the used for, other than the case, the Fig. 5 (a) format of the MAC sub-header (sub-header) out to be used. 다음은 상기 도 4에서 사용되는 각 필드의 보다 자세한 설명이다. The following is a more detailed description of the fields that are used in the FIG. - LCID: 이는 해당 MAC SDU가 어떤 논리채널의 데이터 인지 또는 해당 MAC CE(MAC Control Element)가 어떤 정보를 포함하는지 알려준다. - LCID: whether it is appropriate MAC SDU data of any logical channels or corresponding MAC CE (MAC Control Element) that indicates that it contains any information. - E: 이번 MAC Sub-header뒤에 또 다른 MAC sub-header가 있는지를 알려준다. - E: it indicates whether another MAC sub-header behind this MAC Sub-header is. - F: 따라오는 L필드의 길이를 알려준다. - F: L indicates the length of the field that follows. - R: reserved bit이며, 사용되지 않는 bit이다. - R: a reserved bit, an unused bit. 여기서, 상기 LCID에 사용되는 값들에 대한 정보는 다음의 표로 나타낼 수 있다. 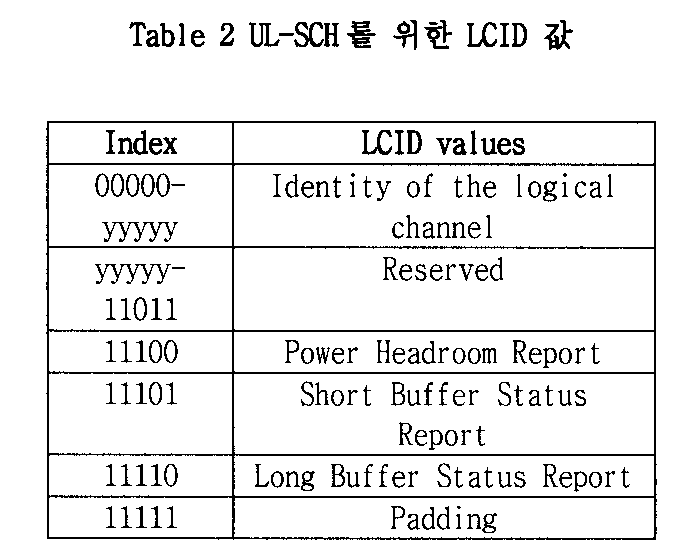 Here, the information on the values ​​used in the LCID may represent the following table. 이하 단말의 RRC 상태 (RRC state)와 RRC 연결 방법에 대해 상술한다. It will be described for the RRC state (RRC state) and a RRC connection method of UE or less. RRC 상태란 단말의 RRC가 E-UTRAN의 RRC와 논리적 연결(logical connection)이 되어 있는가 아닌가를 말하며, 연결되어 있는 경우는 RRC connected state, 연결되어 있지 않은 경우는 RRC idle state라고 부른다. If it is the RRC state is not RRC connected state, connection when connected refers to whether or not the RRC of the terminal and the RRC is a logical connection of the E-UTRAN (logical connection), is called a RRC idle state. Connected state의 단말은 RRC connection이 존재하기 때문에 E-UTRAN은 해당 단말의 존재를 셀 단위에서 파악할 수 있으며, 따라서 단말을 효과적으로 제어할 수 있다. Terminal of the Connected state is because the RRC connection exists, the E-UTRAN can determine the existence of the terminal in the cell unit, and therefore it is possible to effectively control the terminal. 반면에 idle state의 단말은 E-UTRAN이 파악할 수는 없으며, 셀 보다 더 큰 지역 단위인 트래킹 지역(Tracking Area) 단위로 핵심 망(Core Network)이 관리한다. In contrast to the idle state of the terminal it will not be able to identify the E-UTRAN, and a core network (Core Network) managed in the larger unit area of ​​the tracking area (Tracking Area) basis than cell. 여기서 상기 Tracking Area는 셀들의 집합단위이다. Wherein the Tracking Area is an integrated unit of cells. 즉, idle state 단말은 큰 지역 단위로 존재여부만 파악되며, 음성이나 데이터와 같은 통상의 이동통신 서비스를 받기 위해서는 단말은 connected state로 이동해야 한다. That is, idle state the UE is identified only the presence or absence in a large area unit, in order to receive typical mobile communication services such as voice or data terminal may be moved to a connected state. 사용자가 단말의 전원을 맨 처음 켰을 때, 단말은 먼저 적절한 셀을 탐색한 후 해당 셀에서 idle state에 머무른다. When you first turn on the terminal, the terminal, first navigate to the appropriate cell and then stays in the idle state in the cell. Idle state에 머물러 있던 단말은 RRC 연결을 맺을 필요가 있을 때 비로소 RRC 연결 과정 (RRC connection procedure)을 통해 E-UTRAN의 RRC와 RRC 연결을 맺고 RRC connected state로 상태를 이동한다. Terminal which remains in Idle state is entered into until RRC connection procedure (RRC connection procedure) the RRC connection with the RRC of the E-UTRAN through the RRC connection when it needs to enter into the state moves to the RRC connected state. Idle state에 있던 단말이 RRC 연결을 맺을 필요가 있는 경우는 여러 가지가 있는데, 예를 들어 사용자의 통화 시도 등의 이유로 상향 데이터 전송이 필요하다거나, 아니면 E-UTRAN으로부터 페이징 메시지를 수신한 경우 이에 대한 응답 메시지 전송 등을 들 수 있다. If the UE was in the Idle state it is necessary to bear the RRC connection, there are a number of, for example, In, such as the user of the call attempt is why it requires a uplink data transmission, or, or when it receives a paging message from the E-UTRAN for the like response message sent. Idle state의 단말이 E-UTRAN과 RRC 연결을 맺기 위해서는 상기한 바와 같이 RRC 연결 과정 (RRC connection procedure)을 진행해야 한다. Idle state of the mobile station in order to bear the E-UTRAN RRC connection and shall proceed with the process of RRC connection (RRC connection procedure) as described above. 상기 RRC 연결 과정은 크게, 단말이 E-UTRAN으로 RRC 연결 요청 (RRC connection request) 메시지 전송, E-UTRAN이 단말로 RRC 연결 설정 (RRC connection setup) 메시지 전송, 그리고 단말이 E-UTRAN으로 RRC 연결 설정 완료 (RRC connection setup complete) 메시지 전송의 세 단계로 이루어진다. The RRC connection procedure is significantly, the terminal RRC Connection Request (RRC connection request) message transmitted to the E-UTRAN, E-UTRAN the RRC connection setup to the UE transmitted (RRC connection setup) message, and the terminal RRC connection with E-UTRAN setup complete (RRC connection setup complete) three stages of a message transmission. 이러한 RRC 연결 과정을 도 6에 도시하였다. This RRC connection procedure is shown in Fig. 보다 자세하게, 먼저Idle state의 단말은 통화 시도 또는 E-UTRAN의 페이징에 대한 응답 등의 이유로 RRC 연결을 맺고자 할 경우, 먼저 단말은 RRC 연결 요청 (RRC connection request) 메시지를 E-UTRAN으로 전송한다. When more particularly, a terminal in Idle state before the characters entered into a RRC connection of reasons, such as call attempt or a response to a paging of the E-UTRAN, the first terminal transmits the RRC Connection Request (RRC connection request) message to the E-UTRAN . (1 단계) 이때, RRC 연결 요청 메시지는 단말의 초기단말식별자 (Initial UE identity)와 RRC 연결 이유 (Establishment cause) 등을 포함한다. (Step 1) In this case, the RRC connection request message including the initial terminal identifier (Initial UE identity) and the RRC connection reason (Establishment cause) of the terminal. 초기단말식별자는 단말 고유의 식별자로서, 전세계 어느 지역에서도 해당 단말을 식별할 수 있도록 한다. The initial terminal identifier to a terminal of a unique identifier, identifying a terminal in any other countries. RRC 연결 이유로는 여러 가지가 있으며, 통화 시도라던가 페이징에 대한 응답 등의 이유가 있다. RRC Connection reasons are several, there is no reason such a call attempt Knit response to paging. 단말은 RRC 연결 요청 메시지를 전송과 동시에 타이머를 구동하고, 타이머가 만료될 때까지 E-UTRAN으로부터 RRC 연결 설정 (RRC connection setup) 메시지 또는 RRC 연결 거절 (RRC connection reject) 메시지를 수신하지 못하면 RRC 연결 요청 메시지를 다시 한번 전송한다. Terminal drives a timer, the RRC connection request message at the same time as transmission, the timer is set RRC connection from the E-UTRAN until it expires (RRC connection setup) message or an RRC connection reject (RRC connection reject) does not receive the message, RRC connection It sends a request message again. RRC 연결 요청 메시지의 최대 전송 회수는 특정 값으로 제한되어 있다. Maximum retransmission number of the RRC connection request message is limited to a specific value. 단말로부터 RRC 연결 요청 메시지를 수신한 E-UTRAN은 무선 자원이 충분한 경우에는 단말의 RRC 연결 요청을 수락하고, 응답 메시지인 RRC 연결 설정 (RRC connection setup) 메시지를 단말로 전송한다. If the terminal is sufficient from the E-UTRAN radio resource is received the RRC connection request message accepts the RRC connection request of the terminal, and transmits the setup response message, the RRC connection (RRC connection setup) message to the terminal. (2 단계) 이때, RRC 연결 설정 메시지에는 초기단말식별자와 함께 무선망임시식별자 (C-RNTI, Cell Radio Network Temporary Identity) 및 무선베어러 설정 정보 등을 포함하여 전송한다. (Step 2) In this case, RRC connection setup message is transmitted including a radio network temporary identifier (C-RNTI, Cell Radio Network Temporary Identity) and radio bearer setup information and the like with an initial terminal identifier. 무선망임시식별자는 E-UTRAN이 connected state 단말을 식별하기 위해서 할당하는 단말 식별자로서, RRC connection이 존재하는 경우에만 사용되며, 또한 E-UTRAN 내에서만 사용된다. Radio network temporary identifier is a terminal identifier allocated to identify the E-UTRAN connected state terminal, are used only if the RRC connection is present, it is also used only in the E-UTRAN. 단말은 RRC connection이 맺어진 이후에는 E-UTRAN과 초기단말식별자 대신 무선망임시식별자를 사용하여 교신한다. UE after the RRC connection is forged communication using the E-UTRAN and an initial terminal identifier instead of the radio network temporary identifier. 그 이유는 초기단말식별자는 단말 고유의 식별자인데 이를 빈번하게 사용하게 되면 유출될 염려가 있고, 따라서 보안상의 이유로 RRC 연결 과정에서만 잠시 사용하고 이후에는 무선망임시식별자를 사용하는 것이다. The reason is that the initial terminal identifier, and the fear of leakage when it is used frequently, it inde of terminal-specific identifier, according to a moment only RRC connection procedure, and for security reasons, the use of a radio network temporary identifier, hereinafter. 이후에, RRC 연결 설정 메시지를 수신한 단말은 먼저 이 메시지에 포함되어 있는 초기단말식별자와 자신의 식별자를 비교하여, 수신한 메시지가 자신에게 전송된 메시지인지 확인한다. Then, the terminal receives the RRC connection setup message is first compared to the initial terminal identifier with his identifier contained in this message and determine whether the received message is a message sent to it. 확인 결과 자신에게 전송된 메시지인 경우, 단말은 E-UTRAN이 할당한 무선망임시식별자를 저장하고, 이를 이용하여 E-UTRAN으로 RRC 연결 설정 완료 (RRC connection setup complete) 메시지를 전송한다. If the check result of the messages sent to it, the UE transmits the RRC Connection Setup Complete (RRC connection setup complete) message to the E-UTRAN radio network temporary identifier by storing the allocated E-UTRAN, and a means. (3 단계) 이때, RRC 연결 설정 완료 메시지에는 단말의 성능 정보 등이 포함된다. (Step 3) In this case, RRC connection setup complete message includes performance information such as a terminal. 단말이 RRC 연결 설정 메시지를 성공적으로 전송하면, 비로소 단말은 E-UTRAN과 RRC 연결을 맺게 되고 RRC connected state로 상태 이동한다. When the UE successfully transmitted the RRC connection setup message, until the terminal is entered into the E-UTRAN RRC connection and moving state and a RRC connected state. 다음은 단말이 망으로 초기 제어메시지를 전송하는 RACH(random access channel)에 대해서 자세히 설명한다. It will now be described in detail with respect to the RACH (random access channel) that the mobile station transmitting an initial control message to the network. 일반적으로 RACH를 이용하는 목적으로는 단말이 망과 시간동기를 맞추기 위한 것과 단말이 상향링크로 데이터 전송이 필요한데 상기 데이터를 전송할 상향링크의 무선자원이 없는 경우에 무선자원을 획득하는 것이다. In general, the purpose of using the RACH is to obtain a wireless resource if the data transmission need in the uplink as those terminal for fitting the terminal to the network and time synchronization is not a radio resource of an uplink to transmit the data. 예를 들면, 단말이 전원을 켜서 새로운 셀로 처음 접근하려고 한다. For example, the UE attempts initial access to a new cell by turning on the power. 이 경우에는 일반적으로 단말은 다운링크의 동기를 맞추고, 접속하려는 셀에서의 시스템 정보를 수신 받을 것이다. In this case, usually terminal, align the downlink synchronization, the system will be receiving information in connection to the cell. 그리고, 상기 시스템 정보를 수신 받은 후에는 상기 단말은 RRC 접속을 위해서 RRC connection request 메시지를 전송해야 할 것이다. And, after receiving the system information is received the mobile station will have to transmit the RRC connection request message to an RRC connection. 하지만, 상기 단말은 현재 망과의 시간동기도 맞지 않은 상태이고 또한 상향링크의 무선자원도 확보되지 않은 상태이기 때문에 RACH를 이용하게 된다. However, the user terminal is using the RACH is not suitable because it is now the time synchronization with the network conditions also are not secured the radio resources of the uplink conditions. 즉, RACH를 이용하여 상기 단말은 망에게 RRC connection request 메시지 전송을 위한 무선자원을 요청하는 것이다. That is, using the RACH, the UE to the network to request a radio resource for an RRC connection request message is transmitted. 그리고 해당 무선자원 요청을 받은 기지국은 상기 단말에게 적당한 무선자원을 할당해 준다. And the base station receives the wireless resource requesting gives allocate an appropriate radio resource to the mobile station. 그러면 상기 단말은 상기 무선자원을 통해서 RRC connection request메시지를 망으로 전송할 수 있다. Then, the UE may transmit the RRC connection request message to the network through the radio resources. 또 다른 예를 들면, 단말이 망과의 RRC 접속이 맺어 있다고 가정하다. In another example, it is assumed that the terminal to join the RRC connection with the network. 이 경우에, 망의 무선자원 스케줄링에 따라서 단말은 무선자원을 할당 받게 되고, 이 무선자원을 통해서 단말의 데이터를 망으로 전송하게 된다. In this case, according to radio resource scheduling of the network terminal it is allocated a radio resource is a radio resource through the transmitting data of the terminal to the network. 하지만, 단말의 버퍼에 더 이상 전송할 데이터가 남아 있지 않다면, 망은 상기 단말에게 더 이상의 상향링크의 무선자원을 할당 하지 않을 것이다. However, if you do not have any more data to be transferred to the buffer of the UE remains, the network will not allocate radio resources in more than one uplink to the UE. 왜냐하면 전송할 데이터를 가지고 있지 않은 단말에게 상향링크의 무선자원을 할당하는 것은 비효율적이기 때문이다. It is because it is inefficient to allocate radio resources in the uplink to the UE that does not have a data transfer because. 여기서 단말의 버퍼 상태는 주기적 혹은 사건 발생적으로 망으로 보고된다. The buffer status of the terminal is reported to the network periodically, or event occurring. 상기 상황처럼 무선 자원이 없는 단말의 버퍼에 새로운 데이터가 생기게 되면, 상기 단말에게 할당된 상향링크의 무선자원이 없기 때문에, 상기 단말은 RACH를 이용하게 된다. When the buffer of the terminal there is no radio resource, as the situation causing the new data, because there are no radio resources of the uplink allocated to the MS, the MS is using the RACH. 즉, RACH를 이용해서 단말은 데이터의 전송에 필요한 무선자원을 망에게 요청하는 것이다. That is, using the RACH UE to request a radio resource necessary for the transmission of data to the network. 일반적으로 기지국과 단말은 특정한 제어신호 또는 특정한 서비스 데이터를 제외하고, 대부분은 전송채널 DL-SCH를 이용한 물리채널 PDSCH (Physical Downlink Shared Channel)을 통해서 데이터를 각각 송신과 수신한다. In general, except for the BS and the MS a specific control signal or specific service data, and most of them respectively receiving and transmitting data via a physical channel PDSCH (Physical Downlink Shared Channel) using a transport channel DL-SCH. 또한 PDSCH의 데이터가 어떠한 단말(하나 또는 복수의 단말들)에게 전송되는 것이며, 또한 상기 단말들이 어떻게 PDSCH데이터를 수신하고 디코딩을 해야 되는지에 대한 정보 등은 물리채널 PDCCH (Physical Downlink Control Channel)에 포함되어 전송된다. Will also be transmitted to the data of the PDSCH any UE (one or a plurality of the terminal), and including information on whether the UE should do to receive and decode the PDSCH data that is contained in the physical channel PDCCH (Physical Downlink Control Channel) It is transmitted. 예를 들면, 특정 PDCCH가 A라는 RNTI(Radio Network Temporary Identity)로 CRC masking되어 있고, B라는 무선자원(예를 들면, 주파수 위치)을 통해서 C라는 전송형식정보(예를 들면, 전송 블록 사이즈, 모듈레이션과 코딩 정보 등)로 전송되고 있는 데이터에 관한 정보를 포함하여 특정 서브프레임(sub-frame)에서 전송되고 있다고 가정해보자. For example, a (Radio Network Temporary Identity) RNTI of certain PDCCH is A and the CRC masking, radio resources of B, for transmission format information (for example, that C through (e.g., a frequency location), transmission block size, suppose, including information about the data that is being sent to the modulation and coding information, etc.) is transmitted on a particular sub-frame (sub-frame). 이렇게 되면, 해당 셀에 있는 하나 또는 둘 이상의 단말들은 자신이 가지고 있는 RNTI정보를 이용하여 상기 PDCCH를 모니터링 하게 되고, 만약 해당 시점에 A RNTI를 가지고 있는 하나 또는 둘 이상의 단말이 있다면, 상기 단말들은 상기PDCCH를 수신하게 되고, 이 때 수신된 PDCCH의 정보를 통해 B와 C에 의해 지시되는 PDSCH를 수신하게 된다. When this happens, one or more terminals in the cell are monitoring the PDCCH using RNTI information that they have, if any, at the time the one or more terminals that have A RNTI, the user terminal are the and it receives the PDCCH, and receives the PDSCH indicated by B and C through the information of the received PDCCH at this time. 앞서 전술하듯이, 본 발명은 기지국과 단말이 데이터 및 제어 메시지를 주고 받는 과정에서, 효과적으로 각각의 데이터 및 제어 메시지의 타입을 구분하는 방법을 제시하고자 한다. As previously mentioned, the present invention is in the process of the base station and the terminal to send and receive data and control messages, and to present a method for effectively separating the types of the respective data and control messages. 특히 본 발명은 MAC엔티티가 수신된 MAC PDU를 MAC SDU로 재구성하여 상위단으로 전달하거나, 혹은 상위단으로부터 수신한 MAC SDU를 MAC PDU로 구성하여 전송하는 과정에 있어서, 공통제어채널의 데이터와 그렇지 않은 데이터를 쉽게 구분하고 효과적으로 전송할 수 있는 방법을 제시하고자 한다. In particular the present invention relates to a process of delivering to reconfigure the MAC PDU of the MAC entity is received by the MAC SDU to the upper end, or transmission by configuring a MAC SDU received from the upper stage to the MAC PDU, or the data on the common control channel; the data that are easily identified and to suggest how that can be transferred efficiently. 이를 위해 본 발명은, 단말은 공통제어논리채널의 데이터를 전송하는 경우, 상기 단말의 MAC엔티티는 상기 데이터를 이용하여 MAC PDU를 구성할 때, 상기 데이터에 대한 MAC 서브헤더(Sub-header)에 대해서, 상기 MAC 서브헤더의 LCID필드를 특정 값으로 설정하여 전송할 것을 제안한다. The present invention to accomplish this, the mobile station when transmitting data of a common control logical channel, MAC entity of the terminal to configure a MAC PDU by using the data, MAC sub-headers (Sub-header) for the data respect, it proposes to transmit by setting the LCID field of the MAC sub-header to a certain value. 이와 더불어, 본 발명은, 단말은 공통제어논리채널의 데이터가 아닌 데이터를 전송하는 경우, 상기 단말의 MAC엔티티는 상기 데이터를 이용하여 MAC PDU를 구성할 때, 상기 데이터에 대한 MAC 서브헤더에 대해서, 상기 MAC 서브헤더의 LCID필드를 상기 데이터에 관련된 논리채널에 대해서 지정된 값으로 설정하여 전송할 것을 제안한다. In addition, the present invention, the mobile station when transmitting data, not the data of the common control logical channel, MAC entity of the terminal with respect to, MAC sub-header for the data to configure a MAC PDU by using the data , suggests that transfer to the specified value for the LCID field of the MAC subheader to the logical channel associated with the data. 이 때 논리채널에 대한 지정된 값은, RRC연결설정과정 또는 호의 설정과정에서, 기지국이 단말에게 RRC메시지를 통해서 알려준다. Given value for this time, the logical channel, the RRC connection setup or call setup process, the base station informs the terminal via a RRC message. 보다 구체적으로, 본 발명에서 단말이 상기 도 7에서 설명된 RACH message 3를 통해서 MAC PDU를 전송하는 경우, 만약 RRC메시지가 상기 MAC PDU에 포함되고, 상기 단말이 아직 RRC connected mode에 있지 않은 경우, 상기 단말은 상기 MAC PDU의 헤더에 있는 LCID필드를 특정 값으로 설정하여 전송한다. When more specifically, the UE transmits the MAC PDU through a RACH message 3 is described in FIG. 7 in the present invention, if the RRC message is contained in the MAC PDU, if the terminal is not already in the RRC connected mode, the SS transmits to set the LCID field in the header of the MAC PDU to a specific value. 또한, 상기 과정에서 상기 특정 값은 상기 LCID를 포함하는 MAC PDU에 포함된 데이터가 공통제어채널(CCCH) 데이터임을 지시한다. Further, the specific value in the process indicates that the data is a common control channel (CCCH) included in MAC PDU including the LCID. 즉 본 발명은 CCCH메시지의 전송에 있어서 사용되는 LCID필드를 단말마다 고유한 값으로 설정하는 것이 아니라, 모든 단말에게 공통적으로 적용되는, 즉 특정하게 고정된 값을 사용할 것을 사용된다. That is, the present invention is used to, i.e., use a certain fixed value rather than setting the LCID field used in the transmission of the CCCH message to a unique value for each terminal, common to all terminals. 또한, 본 발명에서는 LCID필드를 이용하여, 어떤 종류의 논리채널로부터 온 데이터가 전송되는지를 알려줄 것을 제안한다. In addition, the present invention proposes to inform whether using the LCID field, on the data transmitted from some type of logical channel. 즉, 상기 LCID필드를 이용하여 DCCH의 데이터인지 DTCH의 데이터인지는 알 수 없으나, 적어도 CCCH의 데이터인지 아닌지는 알 수 있도록 설정할 것을 제안한다. That is, but is able to know that the data in that the data of the DTCH DCCH using the LCID field, proposes to set up to know is whether or not the data of at least CCCH. 또한, 본 발명은 RACH 과정에서, RACH message 3의 전송을 위한 무선 자원은 특정 단말에게 할당되는 것이 아니라, 즉 특정단말에게만 할당된 RNTI가 아니라, 여러 단말이 동시에 사용할 수 있는 RNTI를 이용하여 할당됨을 고려한다. Further, that the invention is in the RACH procedure, a radio resource for transmission of the RACH message 3 is not assigned to a specific terminal, i.e., not the RNTI assigned only to a specific terminal, assigned to use the RNTI in different terminal can be used at the same time consider. 따라서, 단말 전용의 RNTI가 아니라, 여러 단말이 사용하는 RNTI로 무선자원이 할당된 경우, 상기 MAC PDU에 포함된 RRC메시지를 지시하기 위해서, 특별한 값으로 설정된 LCID를 상기 MAC PDU의 헤더에 포함할 것을 제안한다. Therefore, when the not the RNTI of the UE only, the radio resource assignment to the RNTI for multiple terminals are used, in order to indicate the RRC message contained in the MAC PDU, to include LCID set to the special value in a header of the MAC PDU It suggests. 상기 과정에서, CCCH를 지시하기 위해 사용되는 특별 값은 시스템정보를 통해서 알려질 수 있고 상기CCCH를 지시하기 위해 사용되는 특별 값은 표준에 고정된 값으로 정해질 수 있다. In the process, a special value used to indicate the CCCH may be known via the system information, and a special value used to indicate the CCCH can be set to a fixed value in the standard. 또한, 본 발명은 RACH 과정에서, RACH message 3를 통해서 MAC PDU가 전송되는 경우, 상기 MAC PDU의 포맷은 다른 경우에 사용되는 MAC PDU의 포맷과 다르게 할 것을 제안한다. The present invention is in the RACH procedure, if a MAC PDU transmitted through the RACH message 3, the format of the MAC PDU is proposed that different from the format of the MAC PDU used in other cases. 즉, 특정 단말에게만 할당된 무선 자원 또는 특정단말용 RNTI를 이용하여 할당된 무선자원을 제외한 무선자원이 사용되는 경우와 그렇지 않은 경우가 있는데, 각각의 경우에서 사용되는 MAC PDU의 포맷을 다르게 하는 것이다. That is, there is a case where radio resources other than the radio resources allocated by the radio resource or RNTI for a specific terminal is assigned only to a specific terminal or may not be a used, otherwise the format of MAC PDU used in each case, . 추가적으로, 특정단말에게 전용으로 할당된 preamble 사용된 경우, 즉 전용 프리앰블(dedicated preamble)이 RACH message 1에서 사용된 경우, 이와 관련되어 전송되는 RACH message 3에 대해서, 상기 RACH message 3에 포함된 MAC PDU가 RRC메시지를 포함한 경우, 상기 RRCH메시지를 지시하기 위한 LCID는 RRC메시지를 통해서 단말에게 지정된 값을 사용한다. In addition, if the preamble is used assigned only to a specific terminal, i.e., a dedicated preamble (dedicated preamble) in this case used in the RACH message 1, this is associated with respect to the RACH message 3 is transmitted, it included in the RACH message 3 MAC PDU the case containing the RRC message, for indicating the LCID RRCH message uses the specified value to the UE through an RRC message. 또한, 수신측 MAC 엔티티가 수신된 MAC PDU에 CCCH데이터가 있는지 없는지를 쉽게 판별하도록 하기 위해서, 상기 MAC PDU의 헤더에 포맷지시자를 포함할 것을 제안한다. Further, in order to be easy to determine the receiving side MAC entity, whether there is a CCCH data to the MAC PDU received, it proposes to include a format indicator in a header of the MAC PDU. 즉, 상기 포맷지시자는 상기 MAC PDU에 포함된 데이터가 CCCH데이터인지 아닌지를 알려줄 수 있다. That is, the format indicator may inform whether or not the data contained in the MAC PDU has CCCH data. 즉 CCCH LCID는 수신측 MAC 엔티티로 하여금, 수신된 MAC PDU에 대해서, RRC가 상기 MAC PDU에 포함된 데이터를 처리해야 하는지 혹은 RRC가 처리해야 하는지를 알려줄 수 있다. I.e. CCCH LCID may inform whether the cause the receiving side MAC entity, with respect to the received MAC PDU, the RRC or RRC if the need to process to process the data contained in the MAC PDU. 도 8a, 8b는 본 발명에 따라 사용되는 MAC 서브헤더의 LCID 필드를 나타내는 예시도 이다. Figure 8a, 8b is an exemplary view showing the LCID field of the MAC sub-header used in accordance with the present invention. 상기 도 8a는 DL-SCH를 위한 LCID의 값을 보여주는 표이고, 도 8b는 UL-SCH를 위한 LCID의 값을 보여주는 표이다. The Figure 8a is a table showing the value of LCID for the DL-SCH, Figure 8b is a table showing the value of LCID for UL-SCH. 본 발명에 따른 상기 도 8a, 8b에서는, CCCH를 나타내기 위한 인덱스(index)를 포함하고 있으며, MAC PDU안에 포함된 각각의 MAC SDU, MAC control element 또는 패딩(padding)를 위하여 하나의 LCID 필드가 존재 할 수 있다. In the Fig. 8a, 8b according to the present invention, contains an index (index) for indicating the CCCH, one LCID field for each MAC SDU, MAC control element or padding (padding) included in the MAC PDU It may exist. 여기서 상기 LCID 필드의 크기는 5비트이다. The size of the LCID field is 5 bits. 도 2는 종래기술에서 단말과 E-UTRAN 사이의 무선인터페이스 프로토콜의 제어평면 구조를 나타낸 예시도 이다. 2 is an exemplary view showing a control plane architecture of a radio interface protocol between the UE and the E-UTRAN is also in the prior art. 도 3은 종래기술에서 단말과 E-UTRAN 사이의 무선인터페이스 프로토콜의 사용자평면 구조를 나타낸 예시도 이다. 3 is an exemplary view showing a user plane architecture of a radio interface protocol between the UE and the E-UTRAN is also in the prior art. 도 4는 MAC (Medium Access Control) 엔티티에서 사용하는 PDU (Protocol Data Unit)의 포맷을 나타내는 예시도 이다. FIG. 4 is an exemplary diagram illustrating the format of a PDU (Protocol Data Unit) used in the (Medium Access Control) MAC entity. 도 5a, 5b는 MAC (Medium Access Control) 엔티티에서 사용하는 MAC 서브헤더(sub-header) 포맷을 나타내는 예시도 이다. Figure 5a, 5b is an exemplary diagram illustrating a MAC sub-header (sub-header) format used in the (Medium Access Control) MAC entity. 도 6은 단말과 네트워크간의 RRC (Radio Resource Control) 연결 과정을 나타내는 예시도 이다. Figure 6 is an exemplary view showing a RRC (Radio Resource Control) connection procedure between the UE and the network. 도 7은 단말의 초기 접속 과정을 나타내는 예시도 이다. 7 is an exemplary diagram illustrating an initial access procedure of the UE. 도 8a, 8b는 본 발명에 따라 사용되는 MAC 서브헤더(sub-header)의 LCID 필드를 나타내는 예시도 이다. Figure 8a, 8b is an exemplary view showing the LCID field of the MAC sub-header (sub-header) to be used according to the present invention. 상기 구성된 프로토콜 데이터 유닛을 하위 단으로 전달하는 단계를 포함하는 것을 특징으로 하는 무선 통신 시스템상에서 프로토콜 데이터 유닛을 구성하는 방법. Configuring a protocol data unit on a radio communication system characterized in that it comprises the step of transferring the constructed PDUs to the lower stage. 제 1항에 있어서, 상기 특정 값이 00000로 설정되는 것을 특징으로 하는 무선 통신 시스템상에서 프로토콜 데이터 유닛을 구성하는 방법. The method of claim 1 wherein configuring a protocol data unit on a radio communication system, characterized in that the specific value is set to 00000. 제 1항에 있어서, 상기 PDU는 MAC(Medium Access Control) PDU이고 상기 적어도 하나의 SDU는 MAC SDU인 것을 특징으로 하는 무선 통신 시스템상에서 프로토콜 데이터 유닛을 구성하는 방법. The method of claim 1, wherein the PDU is configured PDU MAC (Medium Access Control) PDU and the at least one SDU is on a wireless communication system, characterized in that the MAC SDU.